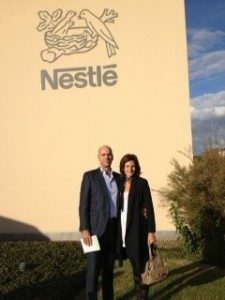 On the 24 and 25 of September 2012, Raúl Fernández, Inma Illan and myself enjoyed a fantastic trip and great experience in Vevey where we attend the seminar “Nestlé – a business model of sustainable leadership”. The San Telmo Business School of Seville in collaboration with Nestlé arranged an in-house seminar titled “Nestlé – a business model of sustainable leadership” in Vevey. We also got to visit the Nestlé Reasearch Center outside Lausanne and their Maison Cailler chocolate factory in Broc. After 27 years of professional involvement in the food industry I was amazed and positively surprised how a company like Nestlé approach the future of food products and customer attention. The human and technological values that I witnessed can only make one believe in a great future for Nestlé and there food products or as they now say – Nutrition, Health or Wellness products. To Laurant, Bernard, Jose, Francisco, David, Luis, Neus, Paul and many more Nestlé employees who made this a fantastic event and also to our San Telmo friends a most heartfelt thank you.